Swimming pools have been around for a long time, and you have probably seen many different types of them. One type that sweeps the market and is just now becoming a favor of more and more home owners is lap pool. Exercise addicts may be very familiar with this type of pool, but most people have little acquaintance. 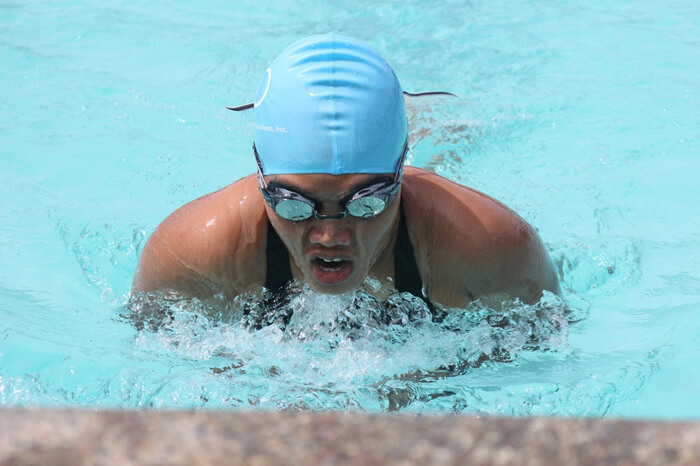 Compared with full sized pools, lap pools are in small compact size, which are suitable for those who have limited room in the house and love doing daily swimming workout to keep body in health but don’t want to spend much money and time on the city gym center. 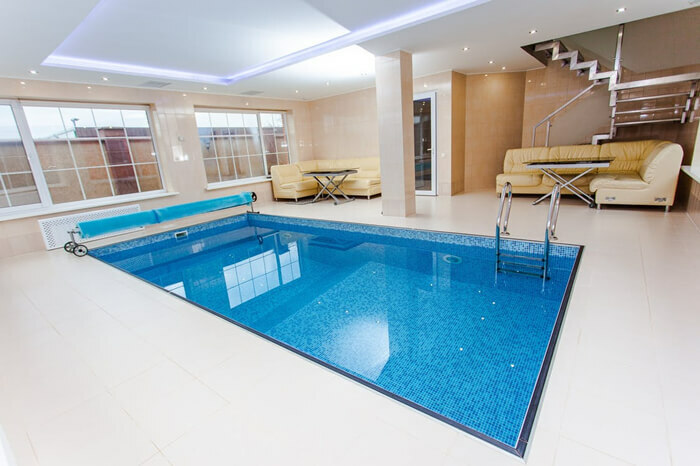 In this article, BluwhaleTile is going to give a brief introduction about lap pool and show some inspiring residential lap pool designs. If you are also interested in lap pool designs then this article will help you plan and build your own. Lap pool is classified as exercise pool. It is often long and narrow rather than round. This design allow people to swim a long distance at a time and go back and forth as many times as they want. A lap pool commonly have at least 45 feet in length, 10 feet in width and 3 feet in depth. If you want a pool that can both satisfy your training need and offer recreational benefits to your family but don’t like to build a competition pool, a L-shaped lap pool is a good choice due to the additional lane where you can take a rest. You also can accommodate a wider deck area on the top that your elder family members and kids can paddle there. Generally, a lap pool is just large enough for one person to swim. However, people like to convert it with more features. So we can often see the designs there are a least two lanes for two people swimming at the same time. 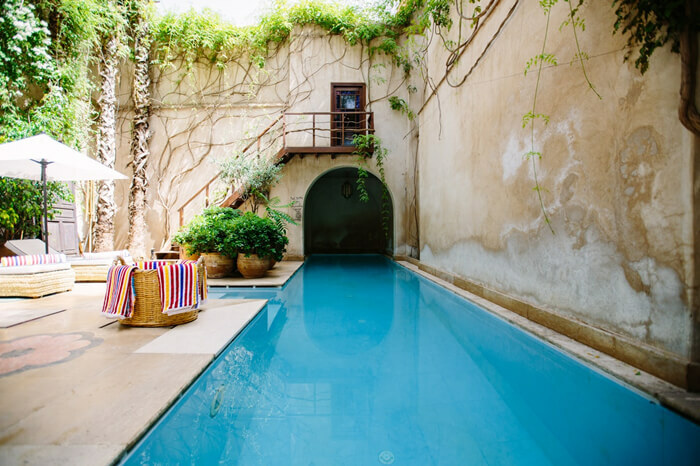 When people build a pool like that, they will often choose to widen the pool into two or three lanes as long as there is still room left in the backyard provided the landscape is not negatively influenced. In this way, the pool is close to a recreational pool but keep the focal use of exercise. Also, this is a great option for people who have smaller backyards but still aspire an in-ground pool. This lap pool is placed indoors and well furnished. It is a typical lap pool for one person use at a time. The design is simple and modern, just a nice rectangle in proper length and width, equipped with a rolling cover and metal stair. However, the pool is completed far more than that. 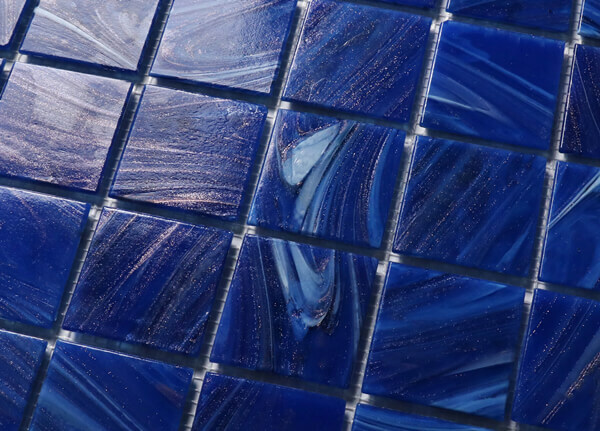 One of the highlights is the beautiful blue mosaic pool tiles. The owner chose a blended instead of a pure blue color that really vitalizes the pool water, making it look more clean and fresh. 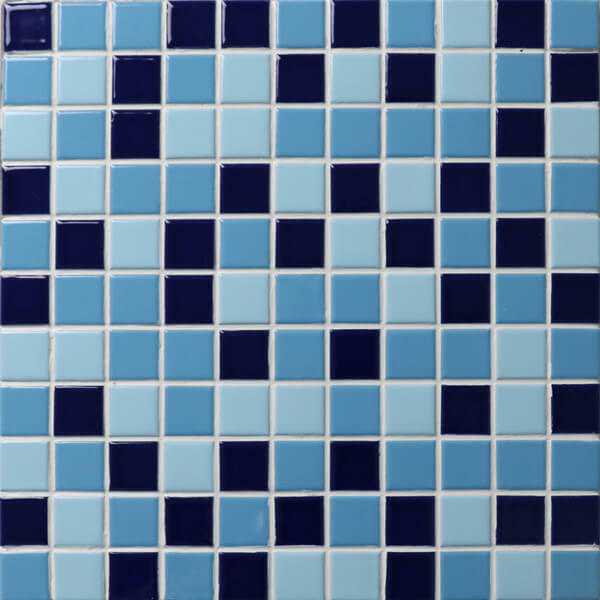 Here we pick up two pool mosaic tiles that are similar to this lap pool shows. One is made of glass, the other is porcelain. This lap pool is in a nice rectangular shape as well, but it is embellished with more personalized features, such as the above ground fountain counter and the sloping walk-in steps. You can see the pool is plainly decorated but one outstands is its dark blue border with silk pattern. BluwhaleTile Venus Cloud Series have the same pattern and surface with that border but different in chip size. However, you can cut a row out for your border decoration and don’t need to buy one. 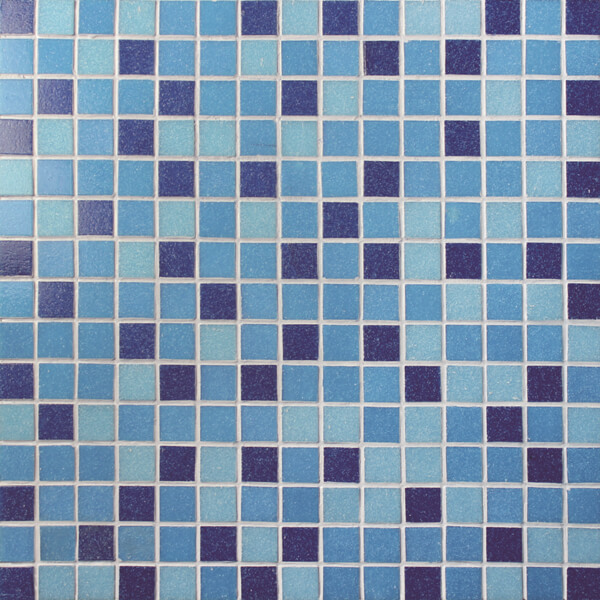 Swimming pool mosaic tiles always have a magic to meet your flexible need no wonder it is popular in the pool construction industry. Settled outdoors, this lap pool is wrapped around by bricks, and there are few plants around the pool area, which make the backyard design compact and concise. One of the appealing design elements of this lap pool is the narrow platform about one third down the pool. It is a smart design that divides the pool into two parts subtly. One section is mainly for swimming, and the rest can be taken as a swim spa or recreational place. 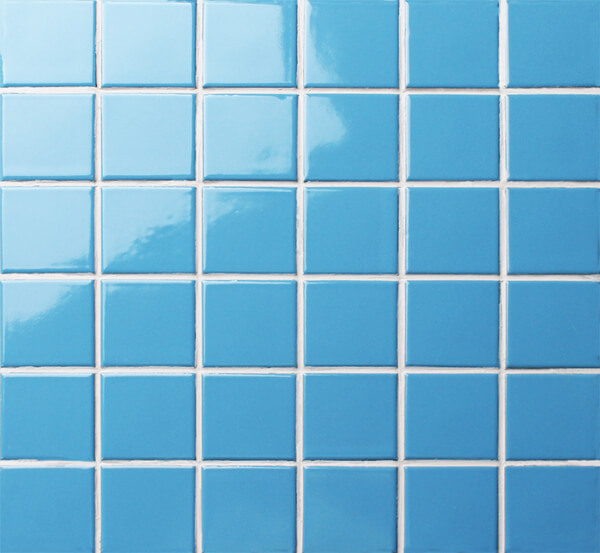 The dark blue swimming pool border tiles designs is also impressive, serving as a transition between the off-white deck and the light blue water. This lap pool blends perfectly in the surrounding, especially it is smart to build the pool under the loft where there is a hollow. It looks as if the pool extended far away visually. In the middle of the pool, there is a branch for walk in and out and in the end there is your rest place where equipped with benches and umbrella. You may ask why the pool water looks so clean and blue. That must be benefit from the cool pool tiles. Here we also pick up a similar product for your reference. 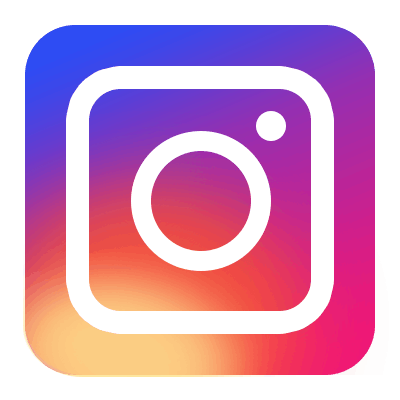 BluwhaleTile is the pool tile company for years. 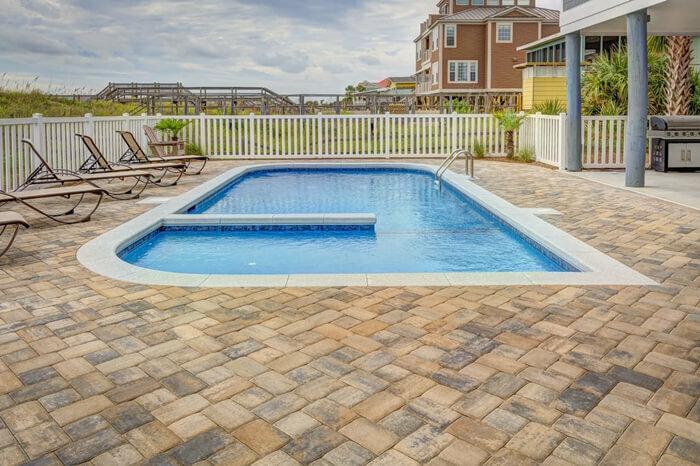 We offer customized service on pool tile, united pool tile, pool mosaic murals and any related pool accessories for any residential and commercial, small and large swimming pool projects. Welcome to contact us for a free quote TODAY at http://www.bluwhaletile.com/.